“The meaning of generosity is very clear. All human beings have possessions. But why do you obtain and keep these things? Are they only for your own pleasure, or do they help you to help others?” So begins Zen Master Seung Sahn’s discussion of the Six Paramitas in The Compass of Zen, his compendium of the essential teachings of the three main schools of Buddhism . In the Mahayana tradition, the virtue of generosity is generally regarded as foundational to the path of liberation. In his introduction to a collection of essays titled Dana: The Practice of Giving, Bikkhu Bodhi explains that “in the Pali suttas, we read time and again that ‘talk on giving’ was invariably the first topic to be discussed by the Buddha in his ‘graduated exposition’ of the dhamma.”  Why such strong emphasis on this quality of behavior that isn’t explicitly regarded as a component of the Noble Eightfold Path in its own right? The answer to this question is pretty simple: the practice of generosity is the most direct route through the all-pervasive delusion of separation between me and all other human beings to the reality of oneness. This delusion, created by thinking, can not be dispelled by more thinking; it can only be cut through by action. “When you help someone else,” Zen Master Bon Haeng has told me, “you’re really helping yourself. There’s no separation.” I’ve seen him demonstrate this principle more than once. There’s a traffic island at the intersection of Route 2 and Alewife Brook Parkway where panhandlers usually stand; we pass it on the way to the Cambridge Zen Center. Without missing a beat in the conversation happening in the car, he’ll roll down the window and hold out a dollar bill for the homeless man or woman to take. No fanfare, no “teaching” involved, just simple, spontaneous, appropriate action for the sake of someone else. I recently returned from Thailand, a predominantly Buddhist country where the concept of “merit” is deeply entrenched in the local rituals. I’ve long disparaged this idea of gaining merit as reeking strongly of the Catholic religion in which I was raised, where good deeds done in this life are considered karmic money in the bank to ensure a comfortable position in the next. “The true Buddhist practitioner,” insists the Righteous Judge in my mind, “has no thought of self. Action is taken for the sake of others, not for the sake of one’s own future well being.” Merit-seekers, it logically followed, are deluded. It hadn’t occurred to me that I’d never actually witnessed religious Buddhists in the act of meritorious offering. In the 12-Step Tradition, this is commonly known as “contempt prior to investigation.” Thankfully, my trip to Thailand afforded me the opportunity to investigate. On our first night there, my wife, Jennie, and I, stayed with her family in a traditional Thai riverside house in the village of Amphawa. In the morning, a monk from a monastery farther down the Mae Klong canal paddled by in a wooden boat while making his daily alms rounds. 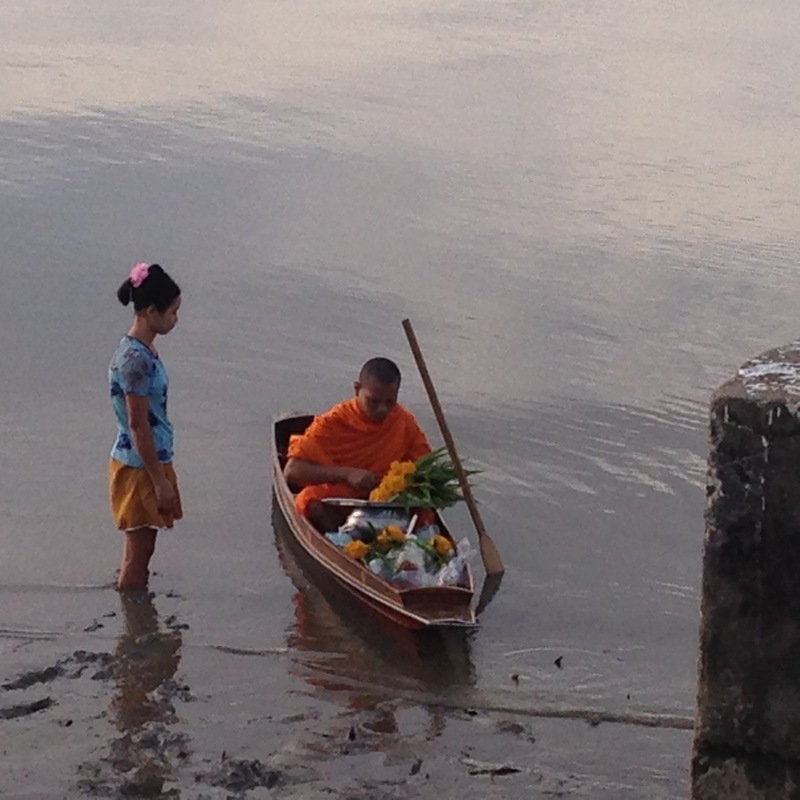 We stood on the concrete walkway along the canal in front of the guesthouse to await his arrival, but the Mae Klong is a tidal waterway, and the tide was out; the monk’s boat could come no closer than 30 feet away from us. I observed all of this, wondering how the situation was going to play out… How would our donations make it from the shore to the boat? It went line this: Naam Phoo, a young woman who manages the guest house, gathered up the packages of food, envelopes of money, and flowers that we’d amassed for the occasion and put them into a large basket. She kicked off her sandals and walked down the concrete steps to the mud exposed by the receding tide. Sinking deeper with each step, she was almost knee-deep in sludge by the time she’d reached the boat. Bowing, the monk accepted the offerings. Naam Phoo bowed back. Words are not exchanged in the formal practice of alms giving. Witnessing this act of selfless sacrifice, it occurred to me that merit is not something gained at some future time, but rather something experienced in the moment by a human being who is available to act for others. It also occurred to me that as I speculated about how the scenario was going to “play out,” the possibility of me crossing the mud flat to the monk’s boat hadn’t presented itself… My “how can I help” mind was nowhere to be found in the situation. Perhaps I was too concerned with indicting the concept of gaining merit to act for someone else’s sake. Zen Master Seung Sahn warns us not to “check other people’s minds.” In 12-Step parlance, the admonition is “don’t take others’ inventories.” Where is my mind in this moment? 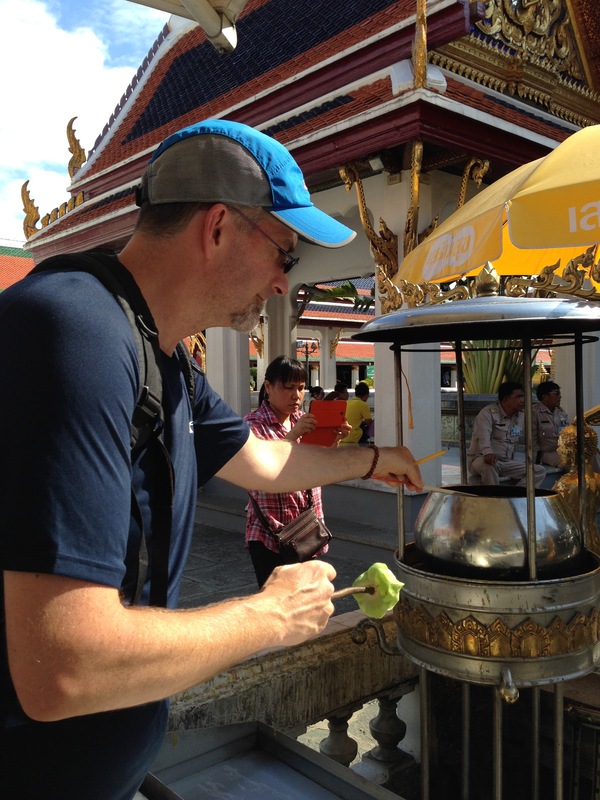 As our trip continued, we visited several temples, making customary offerings of incense, flowers, and money before entering. Following Naam Phoo’s example, I tried to make my offerings with an empty mind and a full heart. True merit has nothing to do with expectation, and everything to do with intention. Zen Master Seung Sahn (1997). The Compass of Zen, Shambhala: Boston & London, p.198.